Navy officer ranks can be confusing to outsiders/civilians and even to those considering a career in the United States Navy. The Navy enlisted experience is much different than the Navy officer career path, especially where promotions and service options are concerned. By the time a Navy officer moves out of the junior grades (Ensign, Lieutenant Junior Grade, Lieutenant, etc.) they have accepted more and more command responsibility. Lieutenant Commanders, Commanders, and Captains may be responsible for organizations and Navy vessels, but when a Navy officer reaches Captain, she or he is at the end of one type of service and considered or groomed for the next level, known as Flag Officer command. Flag officer grades begin with Rear Admiral, Lower Half, roughly equivalent to a one-star General. This position puts the officer in charge of much larger operations such as a Carrier Group or an Amphibious Group. Instead of overseeing the operations of a single organizational entity or ship, a Rear Admiral would oversee a collection of operations and/or vessels. Rear Admirals are the “junior grade” of flag officers, but that designation does not disrespect the officer’s prior experience and command authority; it just signifies that the level of responsibility is much higher and appropriate to the new flag officer’s experience at that command level. Is A Rear Admiral Higher Than A Vice Admiral? The position of Vice Admiral is higher than a Rear Admiral Lower Half, or the next step up in Flag Officer rank, Rear Admiral (referred to by some as Rear Admiral Upper Half). Vice Admirals are often deputy commanders for regional commands such as Navy Region Northwest or Navy Region Mid-Atlantic. The Vice Admiral position is equivalent to a three-star General. Navy flag officer ranks did not always exist in the earliest days of the service; from the time the United States Navy was created in 1775 to 1857, Captain was the highest military rank for Navy officers. Some sources claim that the British Royal Navy’s rank of Admiral was considered too close to the British Empire to be taken on as an American rank. “Too royal” is said to be a complaint of the era with regard to the idea of having a Admiral of the U.S. Navy. But in 1857, Congress authorized the creation of flag officer positions in the Navy to supplement and/or replace not one, but three grade of Captain in the Navy. There are no automatic promotions in the flag officer ranks for the U.S. Navy-a vacancy may be required for the service member to advance. In order to be promoted an officer may also be required to stand before a promotion board to evaluate the service member’s records, presentation, ability to function under the pressure of the board, etc. Time in the current military grade, and overall time in service will also play a role in a Navy officer’s ability to be promoted to the flag officer level. The officer’s fitness for command is reviewed by a promotion board for areas including intelligent risk-taking, maintaining ethical standards, physical fitness, and other areas. Promotion to flag officer ranks means not having major disciplinary issues on the service record, being an example of exemplary service, and completing expected requirements such as continuing education where applicable, attending service colleges and other training as appropriate for the rank and career path chosen. Flag officers including Rear Admirals and Vice Admirals may be required to have no restrictions of their ability to go immediately to a flag officer billet upon confirmation. The U.S. Navy officer promotion system is complicated and difficult to navigate. In recent years the Navy has made adjustments and modifications to its’ officer promotion system to move toward a more merit-based and/or talent-based system. In the past, the date of an officer’s rank, the nature of her work before and after a promotion, and available vacancies. Navy officer pay in general is determined by rank, time spent in that rank, and overall time in service. The lowest ranking Navy officer makes approximately $2,900 a month not including allowances, benefits, and any special pay. A Rear Admiral Lower Half earns more than $100,000 per year, while a Vice Admiral earns upwards of $170,000 per year according to FederalPay.org. Compare that to the earnings of the highest non-flag officer rank of Captain, which starts at just over $75,000 per year. 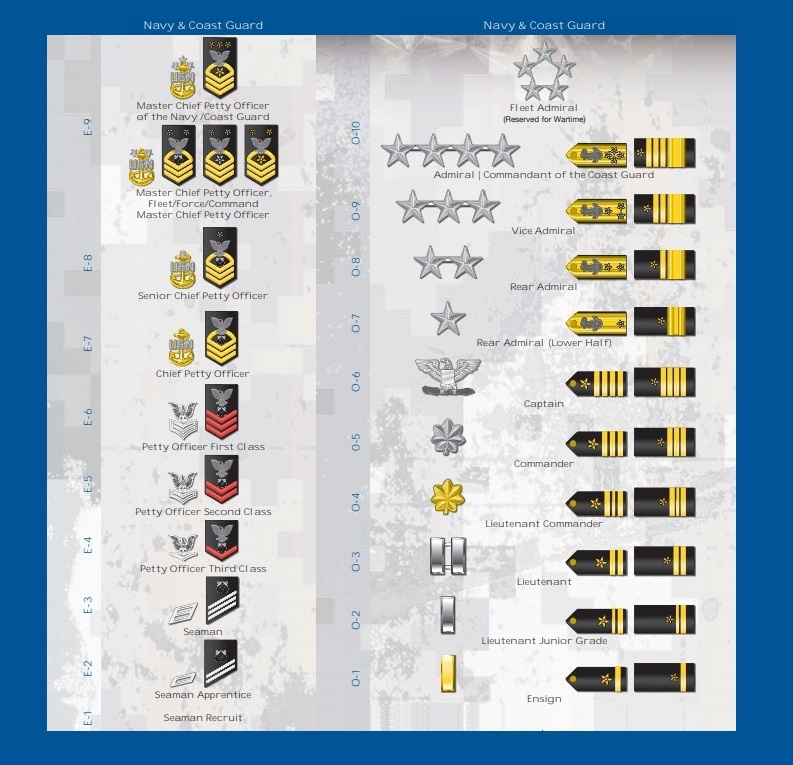 How Are Navy Flag Officer Ranks Abbreviated? Navy Flag Officer ranks are abbreviated in a uniform manner, and have corresponding equivalent ranks in other military services. For example, in the non-flag officer ranks, Ensign is the equivalent to an Army, Air Force, or Marine Corps 2nd Lieutenant. There is another Admiral rank, “Fleet Admiral” which is reserved for wartime use and has not been utilized since it the position was held by Chester Nimitz, who died in 1966. The rank of Fleet Admiral is equivalent to a five-star general and has not been authorized for use since the World War Two era. How Many Navy Flag Officers Serve In Today’s Military? The number of flag officers who serve is regulated by statutory caps, and according to a Congressional Research Service study, the services keep the overall number of flag officers below the minimum for the purpose of being able to expand when required without needing to request additional manpower authorizations in order to fill the required slots. There have been arguments made to increase the number of flag officer positions, including Rear Admirals and Vice Admirals, due to the increased level of coalition operations between the United States military and other countries. A higher ops tempo for coalition operations, so the argument goes, creates a bigger need for senior officers to discuss training issues, planning, and the execution of coalition operations. The experience and training that flag officers including Rear Admirals and Vice Admirals have is considered a major asset in such planning and coordinating, especially where America’s security partners are concerned.